V Nores von der Kriminalpolizei was a Boll bred dog with no trace of Flora (Berkemeyer) SZ 25573 blood. He was not long, or angulated in shoulder and the last section of his tail was missing. 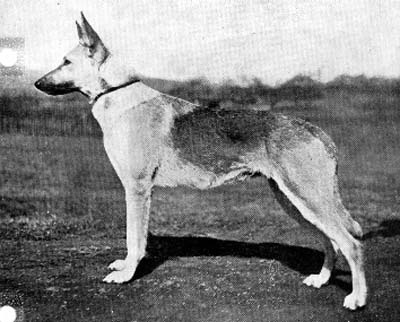 Nonetheless, he was touted as a great sire, and in the summer of 1921, Lawrence H Armour, (Lakeforest Illinois, USA) imported Nores to head his Green Bay Kennels. Everyone wanted a brother to strongheart (Etzel von Oeringen), and V Nores von der Kriminalpolizei was much used for that reason. A portion of V Nores von der Kriminalpolizei progeny were short of tail and a dead loss.